Dr. Campion introduced Prosensa and discussed their background in RNA modulation and their focus on developing novel treatments for DMD. Prosensa evolved from research performed at Leiden University in the Netherlands. Dr. Campion discussed the partnership with Glaxo-Smith Kline and how the licensing of their IP has enabled Prosensa to achieve the results they have experienced. 2013 marked the first positive placebo controlled clinical trial for exon skipping treatment. GSK achieved breakthrough designation as a result. Prosensa has a molecule in "late clinical phase" for exon 55 (targeted at Talen's mutation), as well as a molecule for exon 52 and four molecules currently in clinical trials. No new info here. There was a period of discussion about locations of trials and biomarkers that are used for proving success. I wasn't paying a lot of attention here, but the summary is that there are three centers in the US and plans to expand. PRO044 - Phase 1 completed in Europe. Extension study to begin in Europe EOY2013, US EOY 2014. There was more discussion about the design of the clinical trials, which essentially covered the process for starting and expanding the trial, dose escalation, etc. There was some indication that the trials are intended to keep the children on the drug long term, possibly to provide the drug until it arrives on market. It was mostly boring regulatory talk, though. The biggest point made was that regulatory agencies are receptive to accelerating approvals for future molecules based on the success of drisapersen (pro051). I stopped paying attention for a minute, but I was pulled back in when I heard the discussion turning towards multi-exon skipping. It seems like they've been doing some research on masking 10-18 and 10-30. Not mentioned here, but there is research being done higher in the gene which might produce something beneficial for Talen, but this is significant for a lot of kids who aren't being targeted due to more rare mutations. No estimate to trial was provided though. 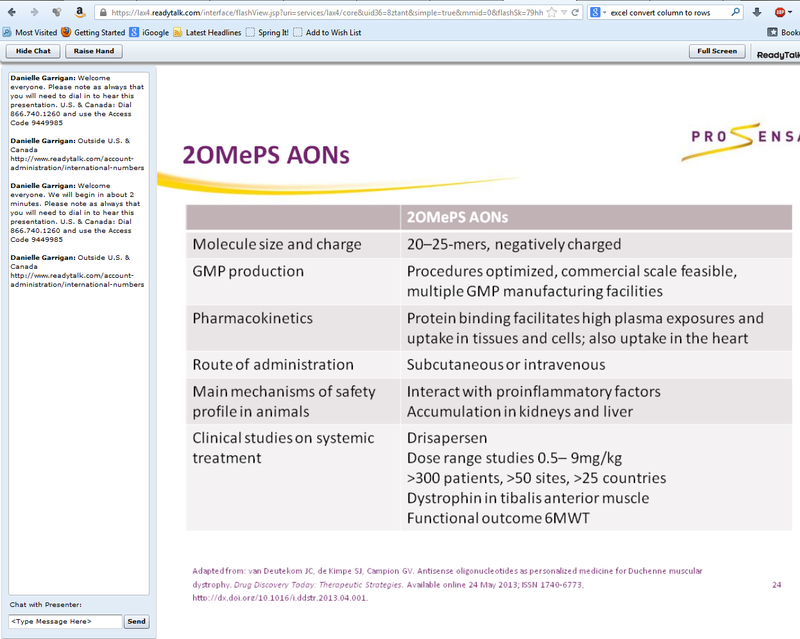 Dr. Campion discussed issues with proteinurea (blood in urine) that has received some coverage. The drug distributes to the kidneys and concentrates in proximal tubules. The side effect was mild and reversible, and from personal experience it is something that occurs in boys with DMD. This was reinforced by the fact that children on placebo also experienced it. The drug is administered through subcutaneous injection, which might make home administration possible. The rest of the info was all boring information about how awesome Prosensa and GSK are. I quit paying attention again after hearing about PRO055 getting pushed out to 2014/2015. Overall, not really worth the time. Not a whole lot of encouraging news about exon 55 skipping.